Have you ever noticed that a great weekend in your workouts can really alter your opinion of how the week went for you? I mean, a great weekend can make a slow mid-week run seem like it didn’t happen. Conversely, a bad weekend can make those great mid-week runs not so impressive. After this weekend, I finally feel like I’m getting back into that fighting condition with my training again! 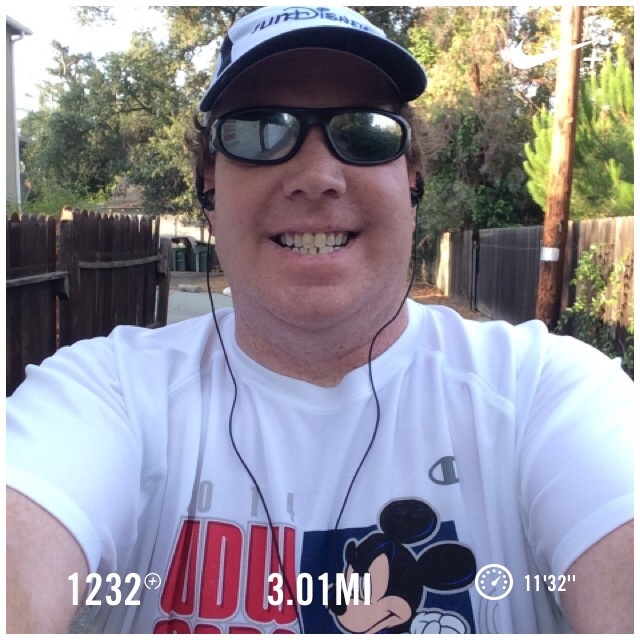 This week I finally made it out for a run on Tuesday morning! The last time I made it out on a Tuesday was just before the Rock n Roll San Diego Half Marathon. So, that was good! The run itself was not so great. Right from the first mile, I could tell it was going to be slow. I’m still getting used to the extra heat. Now, I do understand that So Cal heat is not nearly bad as I’ve been reading about my friends in the South. But, it’s still something to get used to. The first mile took me around 11 minutes. Any time it takes close to 11 minutes in the first mile of a mid week run, it’s going to be slow. So, I just focused on finishing the full 3 miles instead of worrying about how slow I was. I kept going on my intervals, slow as they were. 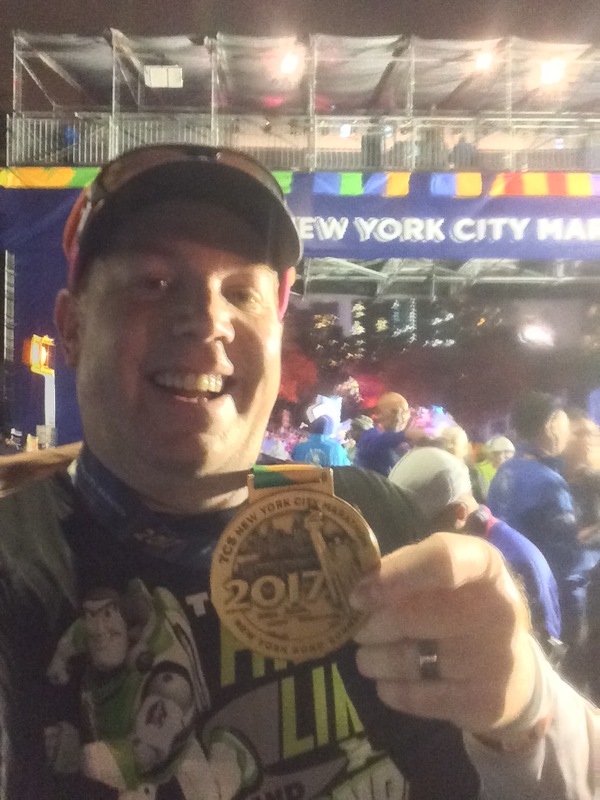 A year ago, I would have been thrilled with this finish time. Not so now. It’s okay, though. Slow runs are better than missed runs. I say that ironically because, on Thursday, I missed my training run. I had a bad night’s sleep the night before. So, by the time the alarm went off, I needed the extra sleep. To be honest, I really did need the extra hour of sleep on Thursday. By the time I got out of bed, I felt a huge difference. 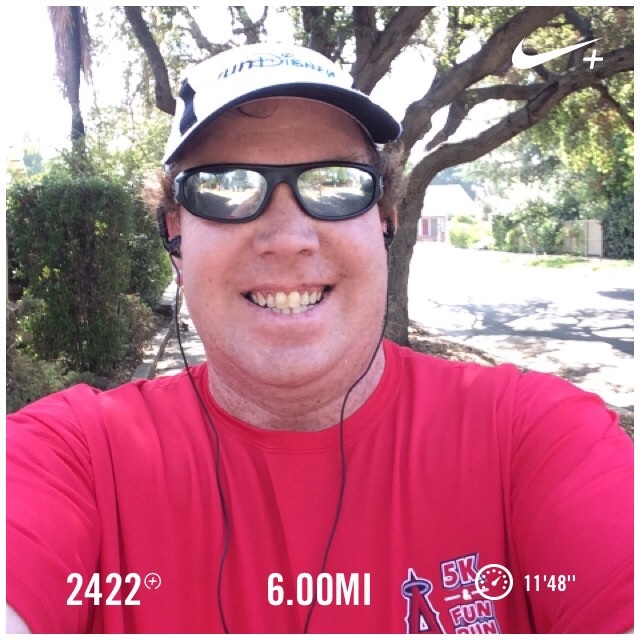 Saturday, I got out for a recovery 6 mile run over my usual 6 mile path. While my overall finish time wasn’t earth shattering, it was almost 2 minutes faster than my previous 6 mile run! Much like that run,I got off to a slow start. It was a little discouraging how slow I was over the first mile. It was faster than my run on Tuesday, but slower than I’m used to on this course. Usually, I’m in the 10 minute, 20 second to 10 minute, 30 second range. On Saturday, it was 10 minutes, 45 seconds. Not a huge difference. However, I could feel like this wasn’t going very fast. Mile 2 was a big mental battle. Since I was off to a slow start, I wondered if I should just go with the marathon intervals instead. I kept going with the run 30 seconds, walk a minute ratio that I typically use on the shorter runs. Even though I was going slow, I wasn’t going as slow as I thought. By the time I got to the end of mile 3, I started changing my mental approach. Instead of wallowing in the slowness of the run, I took a lot of encouragement that I was still below a 12 minute per mile pace. If I kept going, I could finish that way. When I finished mile 5 in under an hour, I was feeling pretty good about what the time would be. Finishing in 1 hour, 10 minutes, 50 seconds wasn’t too bad all things considered. I’m still not a fan of running in these warmer temps. However, on this run, I finally started feeling better about it. Maybe, I’m starting to adjust. 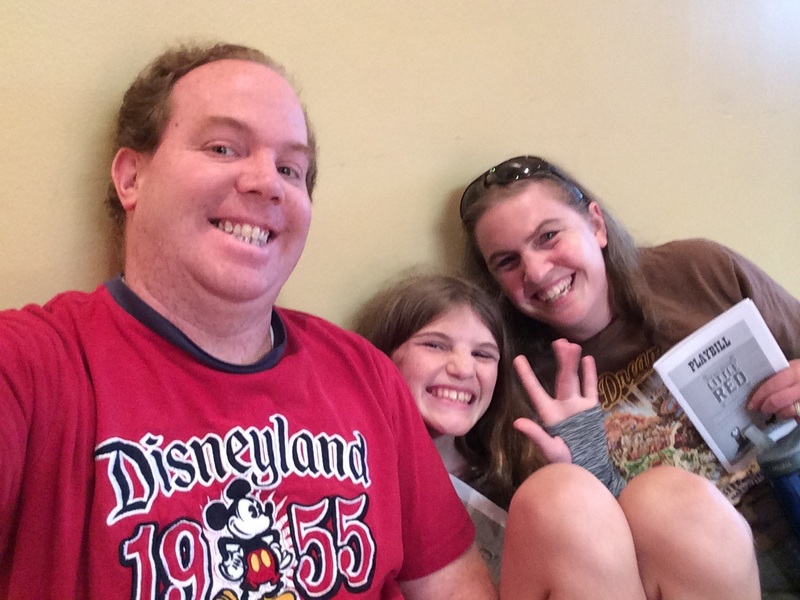 After the run, Brooke and I went off to see this fun little musical in Boyle Heights with my mother-in-law, father-in-law and niece. We arrived a little early. So, there was some time to goof off. 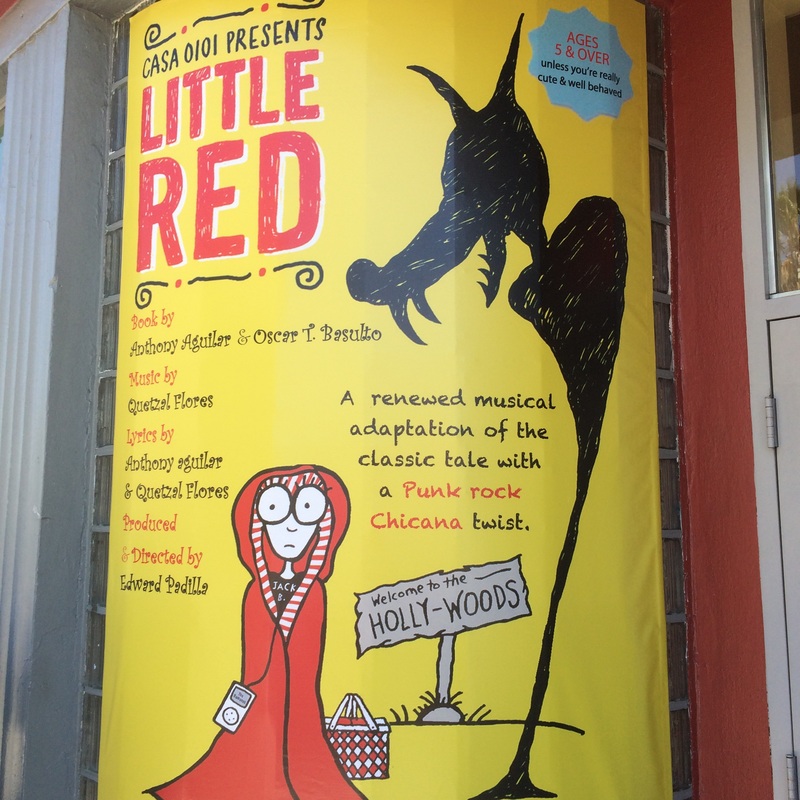 This was not your typical telling of Little Red Ridding Hood. This production was telling the tale with a punk rock and Chicana twist. It’s always fun to see your classic tales told in a new way. It was even set in the Los Angeles area. 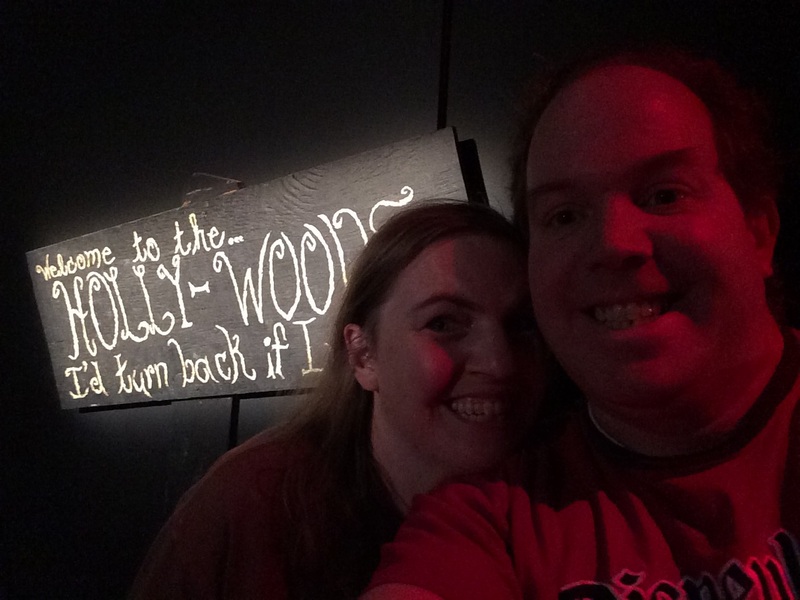 The sign behind us says “Welcome to the Holly-Woods. I’d turn back if I were you.” Yep. Red had to navigate through Hollywood to get to her grandmother’s house. On the way there was this punk rock concert that she’s rather go to. It was a clever little musical that was a lot of fun. After the musical, I got to watch the fireworks from the Magic Kingdom live thanks to the Disney Parks live feed! We got some pool time at my in-laws. While we were in the pool, I got to watch my Angels pound the Texas Rangers! Let me tell you. Watching baseball while in a pool is the best way to watch the game! While I didn’t go out to a fireworks show on the Forth of July, it was still a great day! 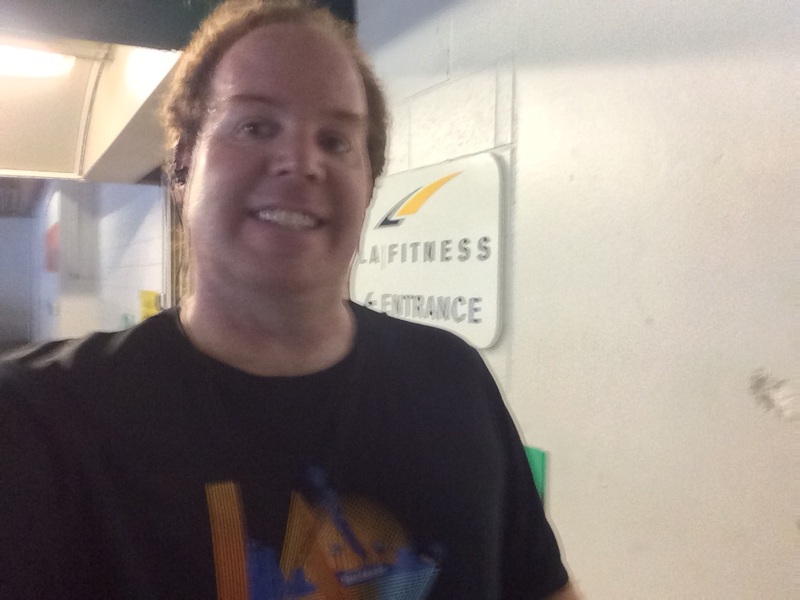 On Sunday, I made it out to the gym again! Two weeks in a row! This gym workout was much better than last week. I decided to back of getting in Yasso 800’s and instead 4 x 400’s on the treadmill. It worked out really well. Since I’ve lost some conditioning since the Rock n Roll San Diego Half Marathon, I dialed it back on the treadmill to build my confidence and conditioning back up. I’m working on consistency. The 4 x 400’s weren’t totally easy. They were slightly challenging and something I felt like I could do (and did!). 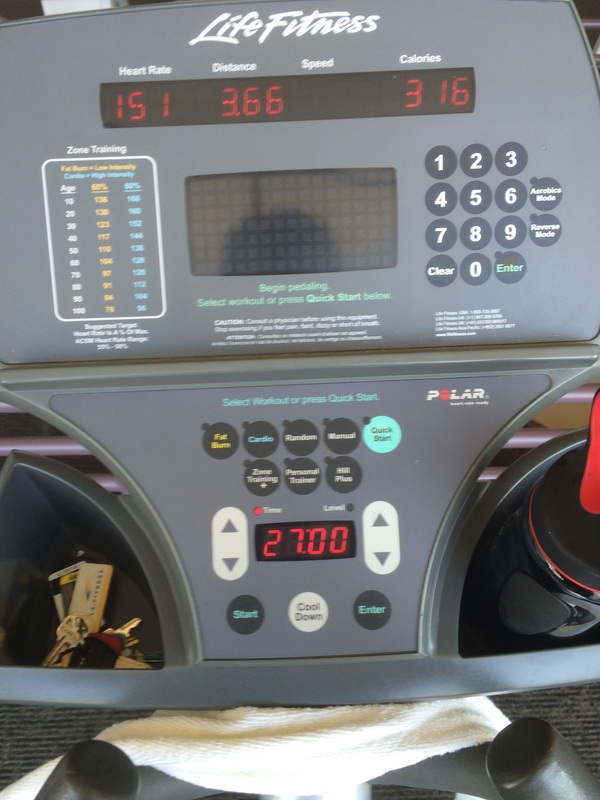 What made this workout feel amazing is that I finally was able to go a full elliptical workout to end this time at the gym! 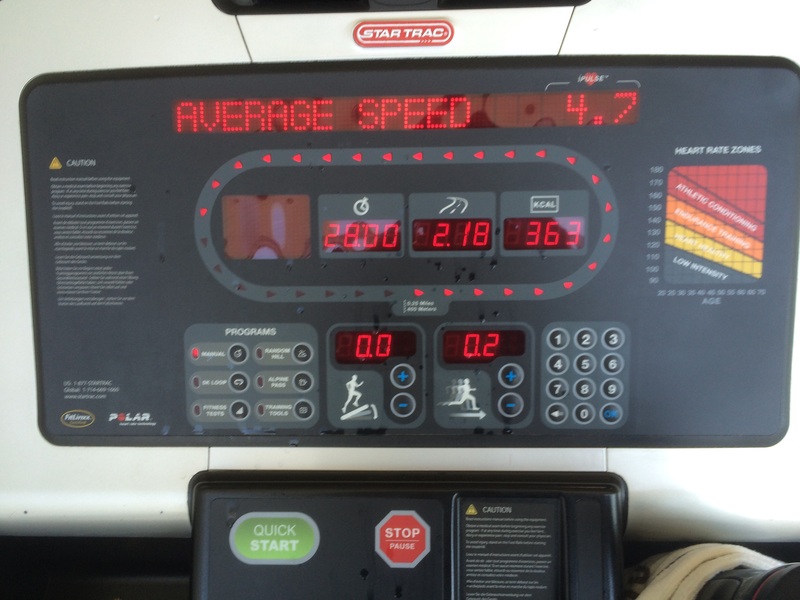 My previous two gym workouts left me too tired to finish with the elliptical machine. So, this was a major victory for me. I did well on the machines I used like last week. If I do well with the machines again, I’ll up the weights I’m using. See? I had a great weekend. So, I feel great about this week. The great weekend helps me deal with the missed run on Thursday and the slow run on Tuesday. I’m building here and I need patience. I’m hoping that this past weekend, I finally got back into gear and am ready to see bigger and better things happen. A good end to the workout week always does make everything look rosier. 🙂 Great job! Thanks. I couldn’t agree more!